This week on Vinally Friday, Robert and Craig will again reach into the crates and Tommy will again highlight one of the many, many modern bands taking advantage of re-surging interest in releasing new music on LPs. 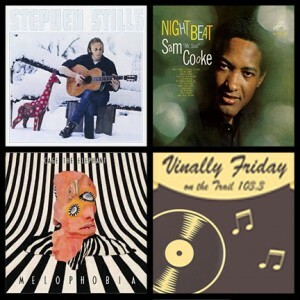 Tune in all day for some deep cuts with that old-fashioned resonance – hisses, pops and needle scrapes included – on Vinally Friday, a weekly tradition on the Trail 103.3! Craig will kick things off with Stephen Stills‘ self-titled solo album. Released in 1970, Stephen Stills is the only record in which both Jimi Hendrix AND Eric Clapton contributed guitar work. It also features work from John Sebastian, Ringo Starr, Booker T. Jones and Stills’ former mates, David Crosby and Graham Nash. Robert will follow up with Night Beat, the 12th studio album by American R&B singer/songerwriter, the King of Soul himself: Sam Cooke. One of the highlights short but sweet career, Night Beat is composed largely of standards and was cut over three late nights in Februrary 1963. Finally, Tommy will introduce the vinyl version of Cage the Elephant‘s popular Melophobia. Recorded in Nashville, the album is the third studio release from the American rockers and marks yet another contribution to the new trend – releasing your work not only digitally and on CD, but on old-school record as well. How popular is vinyl? According to Fortune Magazine, sales were up 32% last year to $416 million, compared to a 17% decrease in CD sales. We’d like to say we started it; we really would. But the truth is, we’re not trend-setters. We just give our listeners what you want. So enjoy the music and enjoy another fine summer weekend in Montana! Finally, it’s Friday! It’s Vinally Friday, only on the Trail 103.3.